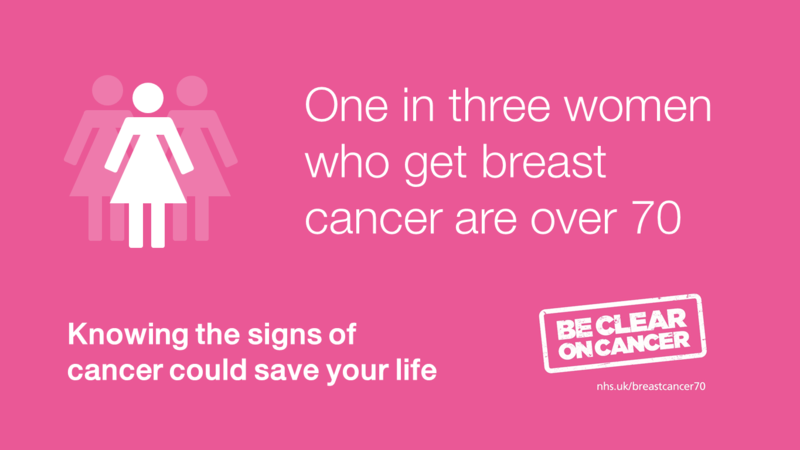 This week we launched our national Be Clear on Cancer campaign to drive awareness of the risk of breast cancer amongst women over 70 including increasing their knowledge of lesser-known symptoms. Although it is widely known that a lump can be a symptom of breast cancer, the disease does not only present itself in this form. We want to make women over 70 aware of non-lump symptoms that might indicate breast cancer, and encourage them to report these symptoms when they appear. It is vitally important that women over 70 are aware of the signs and symptoms, given that the risk of developing breast cancer increases with age and 1 in 3 women who get breast cancer are in this age group. Women with symptoms should be seen by a doctor at the earliest possible opportunity - the earlier cancer is diagnosed, the more treatable it is. We recognise there is a still lot to be done when it comes to making women aware of the medical symptoms of breast cancer. It is perhaps surprising that when asked to name the symptoms, only half of women aged 70 and over (48%) could name a symptom that isn’t a lump. What’s more, research has found that overall; women aged 70 or over have lower knowledge of the non-lump symptoms of breast cancer and are more likely to delay presenting breast cancer symptoms to their GP. This gap in knowledge may be due to women incorrectly assuming they are no longer at risk of developing the disease after routine NHS breast screening invitations cease, despite the fact that the risk continues to rise after the end of these invitations. Women are not currently invited for a breast screening past the age of 70 as there isn't sufficient evidence to support this, but if they haven’t been screened in the last three years and would like to continue going for screening, this can be arranged. Woman can simply contact their local breast screening programme to make an appointment. Whilst we are currently conducting a major research trial looking at the benefits of screening for women between the ages of 71-73, right now we need to urge women within this age group to take their health into their own hands and be vigilant. The impact of increased symptom knowledge on survival rates is clear; early detection and diagnosis of breast cancer is crucial and means treatment is more likely to be successful. It will also reduce the likelihood of needing a mastectomy and may prevent the need for chemotherapy. Last year’s Be Clear on Cancer campaign delivered promising results and I look forward to seeing us replicate and build on our success this year. We found that during the 2014 campaign period we saw a 25% increase in the number of breast cancers diagnosed in women aged 70 and over following an urgent GP referral compared with the same period two years earlier. This year’s campaign also coincides with Ethnic Minority Cancer Awareness Month, which we are pleased to support. Reaching out to ethnic minority communities is something we’re prioritising because research shows that black and Asian women diagnosed with breast cancer in the UK have poorer survival rates than white women. This may unfortunately be due to delays in diagnosis through late presentation with symptoms, or lower uptake of screening opportunities. Breast cancer is the most common form of cancer amongst women in England, with approximately 9,500 women dying from the disease each year. Significantly over half of these are women aged 70 and over. We need to do more to reduce this figure by raising awareness and changing perceptions. We can start now. This summer, let’s be clear on cancer.